It is time to perform says Bridgestone. Bridgestone has launched their new Performance-focused brand campaign ahead of their Super Bowl 2012 Ads. As reported, Bridgestone started to tease the Bridgestone Super Bowl 2012 commercials a week ago. 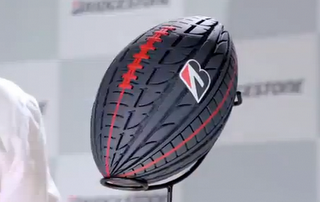 Bridgestone is bringing their tire performance technology to sports balls. Bridgestone has hired well-known professional athletes and sports celebrities to promote their new performance campaign. The overall idea of combining sports with Bridgestone's tire technology is pretty neat and allows the company to familiarize consumers with their different tire types and technologies. Consumers will learn about the tremendous grip provided by the ultra high performance Potenza line, to the smooth, quiet traits of Turanza with Serenity, to the increased fuel efficiency and improved rolling resistance offered by Ecopia, and the breakthrough performance on snow and ice for which the Blizzak name is renowned. The new Bridgestone commercials will dramatize how the attributes from each product could translate to the football field, basketball court, bowling lane and ice hockey rink. In these ads, the tire maker attempts to demonstrate the Bridgestone technologies that drivers can rely on when they need it most. Two of five new sports-themed Bridgestone advertisements will debut during Super Bowl XLVI, which will air live on NBC on Sunday, February 5, 2012. Watch the teaser videos for the Bridgestone Performance Ball Super Bowl 2012 ads here.